Finally, an up-to-date guide to cleaning and disinfection for the food preparation and processing industries. 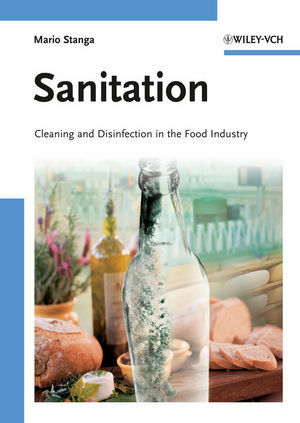 It discusses a host of examples from various food industries as well as topics universal to many industries, including biofilm formation, general sanitizing, and clean-in-place systems. Equally, the principles related to contamination, cleaning compounds, sanitizers and cleaning equipment are addressed. As a result, concepts of applied detergency are developed in order to understand and solve problems related to the cleaning and disinfection of laboratories, plants and other industrial environments where foods and beverages are prepared. Essential reading for food industry personnel. Mario Stanga worked in the Food and Beverage Division of Johnson Diversey from 1977 until 2008 and was the Technical Centre Manager during the latter years. Throughout this time Dr. Stanga has also held numerous seminars and training courses on detergency, sanitation theory, applications and problem solving within Universities, Professional Institutes and at significant industry partners,such as Heineken, Carlsberg, Nestlé and Unilever. Since 2008 he has been working as a consultant to the food industry and held a host of seminars on Food Safety.